Crucifix in glazed ceramic, handmade made in Belgium in the 1970s. Glossy dark green, aqua, brown, deep brown cross with raised Christ figure at its centre. This piece is part of a large ceramic crucifix collection, all made in Belgium between the 1950 and late 1970s. From modernism to brutalism, they range from being as Futurist as a Modernist church to as raw as a Brutalist building. Each artist offered their representation of the faith through volumes and colors. A rare pair of decorative wall-mounted ceramic by Alfred Renoleau. Perfect conditions. Each piece is signed, circa 1900. 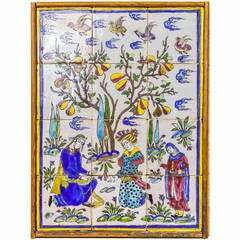 Group of tiles with seated lovers in garden. Dimension: 7-3/4 in x 7-3/4 in (Each tile). Unique wall sculpture on black lacquered panel of the early 1970s by André Dekeijser. Signed and dated. 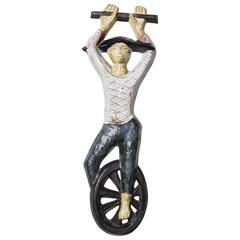 Rare glazed ceramic representing a harlequin from the manufacturer amphora designed by Rogier Vandeweghe, stamped. 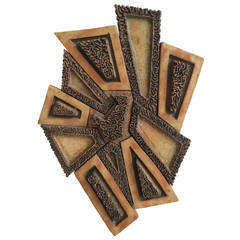 Brutalist wall sculpture in ceramic and crackled glaze. Hanger on back allows it to be hung in three different orientations. Very large multi positional wall ceramic pieces unsigned. 1969. Each piece can behang separate nice condition no chips or cracks.